Crystal clarity. Gain 360-degree vision when navigating the complex US healthcare system – and slash time-to-market. Stakeholders are the key. Why speculate when you can collaborate directly with key payers, FDA and other key influencers, all under one roof? For pharmaceutical companies, it is vital to understand the feedback that their customers, both current and potential, express through all types of channels and contact points. Health care professionals (HCPs) are very active on many social media platforms, including social networking platforms, blogs, and media-sharing sites. HCPs are using social media improve health outcomes, develop a professional network, increase personal awareness of news and discoveries, motivate patients, and provide health information to the community. Companies that can understand the profiles of HCPs can tap into valuable customer insights, new ways of marketing their products and services, and entirely new lines of business. No matter your specialty or the size of your practice or facility, there are healthcare compliance concerns that all medical organizations face. Healthcare organizations must be compliant with changing healthcare trends, guidelines, laws, and government regulations to minimize their risk. To succeed in drug approval process, cost-effectiveness evidence is required, along with organizational, social and ethical evidence on the product. Poor adherence to treatment is followed by a rise in morbidity rates, and therefore, a higher consumption of medical resources. Medication non-adherence is one of the most crucial problems in the healthcare industry. For pharmaceutical companies, pharmacy benefit managers, and pharmacies, medication non-adherence significantly grinds down the profit due to non-adhering of medications by the patients. The growing interest of pharmaceutical companies and healthcare providers on medication adherence poses a greater influence on promoting better healthcare outcomes. National drug shortages, defined by the U.S. Food and Drug Administration (FDA) as a period when the demand or projected demand for a drug within the United States exceeds the supply of the drug, remain a complex and multilayered issue in the U.S. health care delivery system. Drug shortages result in nearly $230 million in additional costs annually for hospitals because of the higher costs of substitute drugs. Some suppliers are recognizing this opportunity and capitalizing on it. It is illegal to share any prescription medication. Prescriptions are personal, meaning that if you possess the medication or drug, but the prescription is for a different person, then you are illegally possessing the drug. Taking prescription medication without a doctor’s approval is dangerous for anyone. The negative consequences of medicine sharing include unanticipated adverse events, complications of incorrect use, delay in seeking professional help, antibiotic resistance, and addiction or misuse related to the addictive properties of some medications. For pharmaceutical companies, it is vital to understand the feedback that their current and potential customers express through all types of channels and contact points about their brands, about their products, and their competitors. Social media listening enables us to gather all that spontaneous benchmarking. To seek diagnosis or better care (see table), many patients are taking steps outside traditional doctor-patient relationships. Health information exchange (HIE) offers tremendous potential for the future, but its widespread adoption and sustainability depend upon engaging patients and earning their trust. Prevalence is a statistical concept referring to the number of cases of a disease that are present in a particular population at a given time, whereas incidence refers to the number of new cases that develop in a given period. The prevalence of a condition may vary enormously from region to region. We count among our clients some the largest companies in the Pharmaceutical industry. Join us in Philadelphia and visit our booth or attend our talk. If you are interested in attending the EyeforPharma Conference (November 13-14th, 2017 – Philadelphia, US), just drop us a line to info@meaningcloud.com. We have an essential discount for you! Stay tuned to access our presentation at the conference, that we will publish on this blog. 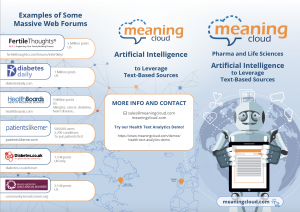 In the meanwhile, if you are curious about how our technology works in the health area, just take a look at our Text Analytics Health Demo. Looking forward to seeing you at the Eye for Pharma Conference! healthcare and pharmaceutical industries (such as electronic health records) as well as data science tools that allow us to extract valuable knowledge from that data.